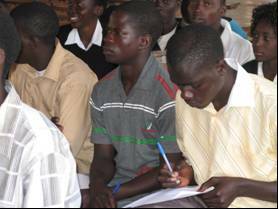 Samfya Bible School has been preparing Christian leaders since 1940 and is a key provider of training in the Luapula Province of Zambia. Every year they train about 30 people who become pastors, evangelists, church planters and change agents in their communities. They produce high quality graduates, many of whom are making a huge impact on their communities. However much has changed in Northern Zambia in the last few decades. 11% of the population is now infected with HIV/AIDS, 10% of the population is an orphan under the age of 18 and 70% of the population lives on less than $1 a day. As a result of their isolation, rural communities have suffered the most in recent years. In response to this crisis Samfya Bible School re-designed its curriculum and now integrates Christian Ministry and Community Outreach components into their education programme. Students will now graduate with the skills, experience and confidence to meet both the spiritual and physical needs of communities in distress. Driven to have a greater impact, the school also developed a new extension teaching program. The program has been taken out into rural communities targeting 30 to 50 Christian leaders at one time. With the teaching capacity to target 3 to 4 communities in addition to keeping the school running, Samfya Bible School is reaching approximately an additional 150 Christian leaders a year through this program. The Christian Brethren Mission Station in Samfya was founded in the mid 1930's by Horace Coleman, a missionary from Scotland. The Bible School itself grew out of Bible study classes that Mr Coleman organised from his house. The current buildings on campus, which are still being utilised, were constructed in 1960. From 1986 until 1991 the school went through a period of decline and was finally shut down. In 1991 under the guidance of Mark Davies it was reopened and in 1997 Rodgers Chama, a gifted Zambian graduate from the Theological College of Central Africa took over as principal. Rodgers worked hard to build up the school and unite local churches. Chama passed away in 2004 and his ministry was then carried on by Levy Chibu. Bright Hope World first became involved around 2002. Initially Bright Hope World supported a percentage of the costs of the college and subsidised the salaries of the staff and the fees of the students. We now provide financial support for the person overseeing the agricultural programme. 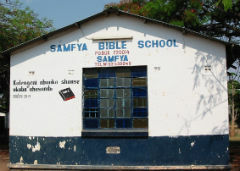 Samfya Bible School has always maintained a unique role in Christian ministry in the Northern Provinces of Zambia. Its uniqueness lies in the fact that the school is focused on training and equipping church leaders from and for rural service. Most of the students that come to the Bible School are from poor rural areas and, much to their credit, the school sees the majority of these students returning to serve in their home villages and communities. 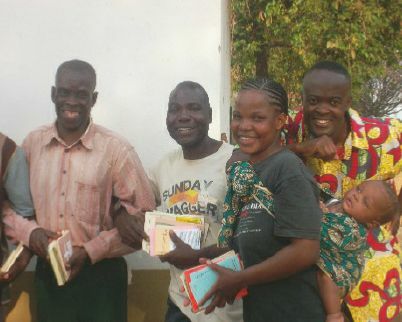 Samfya Bible School has been one of the driving forces behind the evangelism and Christian ministry in Northern Zambia. 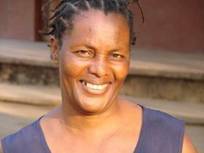 Wathabu is a qualified Rural Development Worker, Bible teacher and environmental activist. He is married to Diana who is a secondary school teacher and a qualified community development worker. Together they have 3 children; Chawila 25, Alinani 21 and Sundo 19. Wathabu is a quiet but visionary and practical man. He strongly believes in team work. He took over from Levy as the Principal of the School early in 2015. 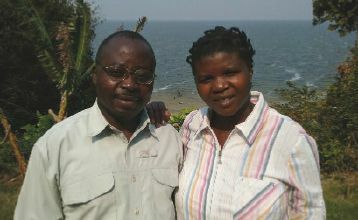 Francis and Cecilia Chola from Mansa Mission Church in Mansa. Francis is a teaching staff member and responsible for the the Projects and Maintenance Department. Cecilia has been instrumental in the Women Ministry with her unique knitting skills which she has taught to many students of the Bible School. They have four children. 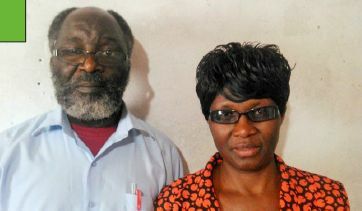 Peter and Jenipher Chomba from Kansuswa East Christian Brethren in Mufulira. Peter is a former miner and joined the Bible School in 2000. Apart from teaching he heads the Students Affairs Department. Jennifer, a mother full of love, has taken on the role of a mother to students that come to the school. They have five children. Collins and Rebecca joined Samfya Bible School in 2013 from Kitwe where Pastor Collins was pastoring at Buchi Kamitondo Christian Brethren Church. He now heads the Academic Department at Samfya Bible School, while Rebecca leads the School Women Ministry. Joseph and Bertha are a young couple with three children. Joseph is a certified accountant and holds an advanced diploma in entrepreneurship. 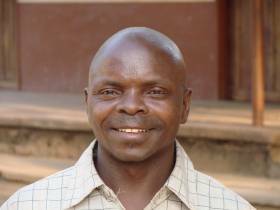 Joseph joined the Bible School in 2012 as the School Administrator. He helps out with the bookshop and the school print shop. Samfya Bible School believe that the Church is created by God and that it is the vehicle that he wants to use to reach out to the lost. Our broadened vision will take a tri-fold teaching approach, providing students with a biblical foundation, experience with Christian Ministry and equipping them with life skills. We seek to raise and develop qualified and credible Church leaders who will rise to the challenge of providing effective leadership to God’s people and at the same time being relevant to the current needs of the society where the Church is found. The Church: Much of the early church work in the region was focused on evangelism and while there are many churches, these churches struggle in part because of poor leadership capacity. In response to this the Bible School is wanting to increase the depth of training that it provides to students, particularly for those who would be interested in taking on a pastoral ministry. In addition to strengthening church leadership, the school would like to invest more heavily in preparing students for a variety of church ministries that would build the church and reach out to the community. The Community: Looking beyond the church and considering the needs of the community. The Bible School has been challenged by the combined crisis of widespread poverty and HIV/AIDS and would like to present a curriculum that equips students to tackle the social crisis that most communities are struggling with in Northern Zambia. Full Time Church Workers: A number of previous Samfya Bible School students that are full time church workers are struggling to make ends meet for their families and for their ministries. The school has therefore decided to incorporate a life-skills component to their curriculum that will provide graduating students with the skills they need to provide for their families and support their ministries. With the changes being made in their curriculum and the introduction of life-skills training in the form of vegetable production/kitchen gardens, poultry and small animal production units, BHW has now shifted its financial support to cover the expenses involved with employing someone to oversee the agriculture programme. We see this life-skills training as vitally important in helping full time church workers become able to be self-sustainable when they return home. Aaron, the person overseeing the agricultural programme, has now built up a very sustainable business with the chickens and so external funding is no longer required from BHW. Martha has been a widow since 2003. She comes from the city of Luanshya on the Copperbelt of Zambia. She comes from the Apostolic Church in Zambia. Her passion is to help orphans and to serve God. Martha has 7 children alive, the youngest is 18 years old. She really enjoys being at the Bible School and loves all the subjects which are all very helpful in her life. When she finishes the course she expects to return to Luanshya and start a ministry to children. In the past she was running some children’s ministry in the church but there were disagreements about the best way to run the programmes. There are many helpless children in the town and she is very concerned about them. When she last helped she started helping 15 and it grew to more than 70. There are two other women who helped her. She is looking forward to getting back to help the children and recommencing ministry to them. Jovan is from Serenje south of Samfya. He is married with seven children and two of them are in Samfya with him. He is a farmer and grew maize and cassava. He was an elder in the church and came to Samfya Bible School to learn the Bible better. He preaches and wants to tell people about Jesus Christ. He loves doing outreach to non believers. He is really enjoying the lessons. The church he came from has between 150 – 200 people and it varies from season to season. It is difficult to be a church leader as most people are very busy. He wants to continue outreach. He has a group of 12 people helping him with this in Serenje. Each year some people come to the Bible School from Serenje, they see training as very important. He is able to pay the fees to come here from selling the things he has grown. He expects to be a better elder after returning to his church after finishing SBS. He should be able to teach much better.